We are in a digital age where technology has allowed globalisation for businesses and opened opportunities for developing countries to work with corporations remotely. Outsourcing has allowed commercial bodies to acquire services from countries anywhere in the world. However, hiring an in-house digital marketing team may not be practical for some businesses. Digital marketing is not limited by location. You can hire anyone from anywhere in the world to render digital marketing services for your business, so long as they have the skills. There are two ways that you can outsource your digital marketing requirements: through digital marketing BPO and through a digital marketing KPO. 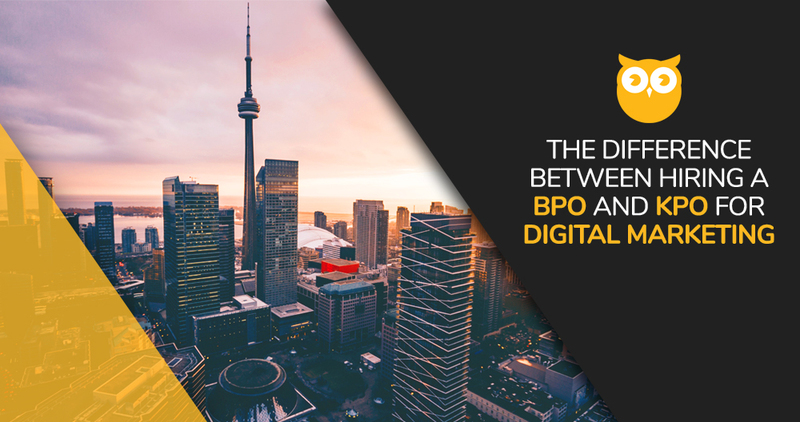 What is BPO and KPO? Business Process Outsourcing or BPO involves contracting operations and responsibilities of a particular business process to a third-party service provider. As the name suggests, BPO is a business model wherein tasks, responsibilities, and goals are all predetermined by the client but are implemented by the digital marketing agency they outsource to. Most of the time, corporations that prefer BPO type services in digital marketing already have a set of clear goals and proven strategies. The only thing missing are the technicians who will be executing the tasks. On the other hand, Knowledge Process Outsourcing or KPO service providers have technicians who can perform high-level tasks. Unlike BPO service providers, KPO offices have more in-depth knowledge about digital marketing. This means that you can assign more daunting tasks like data analysis and delegate work that requires a more experienced digital marketer. These types of service providers are able to perform tasks without much instruction, and can even formulate strategies to meet your goals. Don’t get us wrong, both service providers are more than capable of carrying out tasks and delivering results but each type of service provider has limitation. Knowing these limitations can help you prepare for the problems that may occur in working with outsourced digital marketers. The client has Complete control over campaigns and strategies, and the BPO company will just have to strictly follow the process. BPO digital marketing agencies can easily adapt to changes that are made by the clients. BPO staff costs less because the skill qualification to deliver the requirement is low. Clients will have to provide proven strategies and goals. Clients will have to approve even slight changes that need to take place in the strategies. BPO staff may need supervision. KPO staff has enough experience in carrying out various strategies and in meeting KPIs. KPO staff does not need constant supervision. KPO staff can Provide strategies that would meet business goals. Artistic differences between you and your technician. Clients may have the tendency of losing your personal touch in your campaigns. People with the right expertise can be hard to find. There is no such thing as a perfect digital marketer. Each has its strengths and weaknesses. This is why it is crucial that you find a service provider that is willing to modify their strategies to meet your business goals and will not give you another cookie-cutter strategy. You can hire many digital marketers who will work for you directly and finish tasks on time, but rarely can you find digital marketers who are willing to go the extra mile and give you results that are beyond your expectations. Looking for a team of digital marketing specialist? Talk to us.